These 4 Point Star Sterling Silver Earrings are hand made in Indonesia. 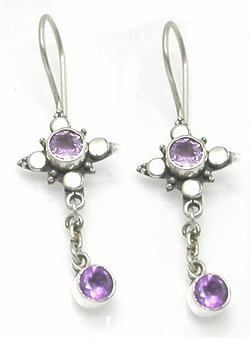 These unique earrings have a purple jewel surrounded by four small crystal jewels and a dangly sterling silver chain with another purple jewel. Check out for this matching 4 Point Star Belly Button Ring to really show people how much you love stars!